Last week, the government of French President Emanuel Macron detailed its plans to rewrite the country’s labor code, aiming to remove all legal barriers for business to lay off workers, lengthen working hours, and slash wages and benefits. Macron is setting into motion a historic confrontation with the working class with explosive global consequences. His poll ratings have plummeted near 30 percent just four months after his election, and his policies face deep opposition among workers and youth. 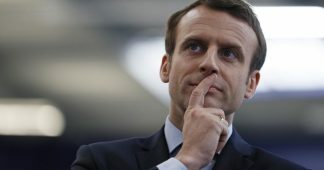 As the US ruling elite slashes health care, public education and other key social programs, and as the European Union negotiates another raft of austerity measures with Greece’s Syriza (“Coalition of the Radical Left”) government, the ruling class internationally sees France as a critical test case. It remembers that the eruption of France’s May-June 1968 general strike sparked revolutionary struggles worldwide. 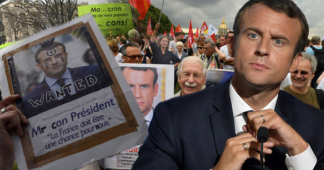 Amidst the deepest crisis of capitalism since the Great Depression of the 1930s, the ruling elite is determined to strangle mass opposition to Macron’s agenda. The working class faces in the Macron administration a conscious and ruthless enemy, dedicated to the destruction of its basic social and democratic rights. The only way for workers to defend these rights is to oppose this government and seek its removal. 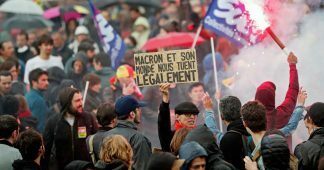 As initial protests are called against the decrees, however, workers need a clear understanding of the revolutionary implications of a struggle against Macron and the need for a new, international strategy and political leadership. Macron, a former investment banker, is proceeding with undisguised contempt for the population. His decrees simply re-introduce the measures which the previous Socialist Party (PS) government of President François Hollande withdrew from its wildly unpopular labor law last year, in the face of mass protests. These include introducing new labor contracts with no job security, limiting penalties for unfair dismissal, and letting employers and trade unions negotiate contracts at the individual firm level that violate the Labor Code. Macron is relying on the complicity and bankruptcy of the trade unions and their political allies. 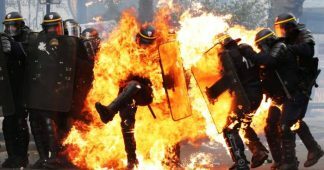 The unions called off last year’s protests, amid a massive police crackdown and PS threats to ban protests under France’s state of emergency, based on worthless promises that the PS would not enforce these measures. Macron, who was elected with PS backing, after the PS collapsed in this year’s elections, is ruthlessly imposing the program of the EU and the capitalist class. The dominant factions of the French financial aristocracy have responded to Trump’s election with plans for an aggressive military alliance with Berlin, to be funded by repudiating the social rights won by the working class in Europe in the 20th century. While the super-rich are to be showered with money, workers are to be hurled back decades. The French Labor Code, passed in 1910 in response to the wave of strikes across Europe provoked by the Russian Revolution of 1905, is only the first target of the militarist offensive. All the social concessions made to the European working class in the 20th century, based above all on the October 1917 revolution and the existence of the Soviet Union, are targeted for destruction. Macron’s ministers are announcing plans to slash health care, pensions and education, while spending billions on defense budget increases and cuts to the Tax On Wealth (ISF). The claim that there is no money for workers’ basic social needs, nearly a decade after the bourgeoisie began pumping trillions of euros into the banks in response to the 2008 Wall Street crash, is a contemptible lie. But as last year’s struggle against the PS labor law showed, a defense of basic social rights will rapidly escalate into a confrontation with the government. 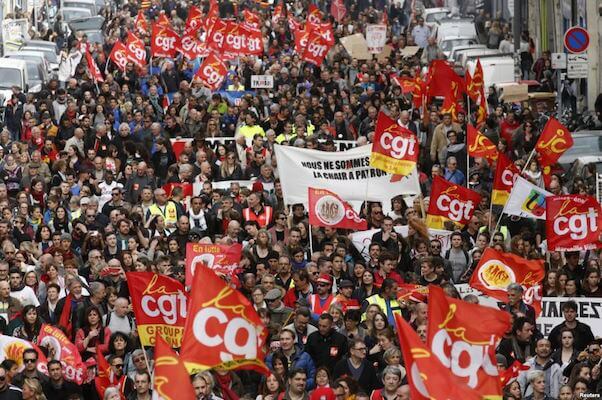 Workers in France face not a trade union but a political fight, which can be waged only in a common revolutionary struggle with their class brothers and sisters across Europe and internationally. 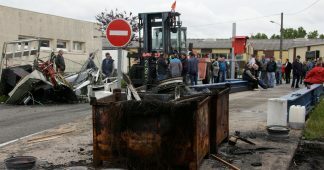 Workers seeking to fight the labor decrees will be compelled to oppose imperialist war and the lies of the “war on terror.” The wars in Libya and Syria, which spawned terror attacks in Europe by Islamist networks the NATO powers backed as proxies in the Middle East, are classical examples of the anti-democratic implications of imperialist war. The PS responded to the terrorist attacks not by cutting off support to Islamist forces in the Middle East, but by declaring a state of emergency suspending basic democratic rights and giving police draconian powers to prosecute youth and workers engaged in constitutionally-protected protests.